Today, I saw a gas station in Wallingford, CT selling gas for $1.99 per gallon. * First time I have seen gas under $2 in a long time. Six months ago, the same gas station was selling gas for nearly twice today's price. 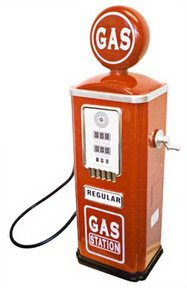 * Tonight, the local news showed gas for sale at another Connecticut location for $1.73 per gallon! Yes. In six monthes, the price of the barrel was divided by tree, and the price we pay at the station was divided by two. F1JKJ --- I'm not happy!